One of the best ways to travel the world while working in a rewarding and profitable field is to seek TESOL certification. TESOL stands for "teachers of English to speakers of other languages." People who earn TESOL certification either teach English as a second language (ESL) or English as a foreign language (EFL). You can teach English as a second language in the United States and all over the world. ESL courses help people who speak another language, such as Spanish, learn the basics of English in countries where English is spoken. ESL is offered in most public and private school systems throughout the United States. English as a foreign language is generally taught in countries where English is not the primary language. EFL is often taught to students around the world who want to apply to colleges and universities in the United States. Most facilities require foreign students to provide test scores that prove a basic understanding of the English language. If you want to become certified to teach ESL or EFL, you need to meet a few minimum requirements. These requirements vary according to the grade level of study, and the country in which you seek certification. In places like Korea, an AA is all that is needed to teach, while in some countries, such as China, you only need a high school diploma to be eligible. Most language schools also require teachers to provide proof of some sort of certification course work as well. 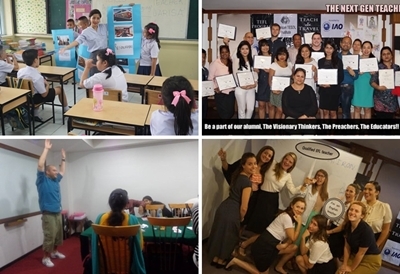 One of the best ways to gain experience teaching English to foreign students is to volunteer in your local community. Volunteer work requires the least amount of certification, and is a great way to explore the world of ESL and EFL education. If you're planning on teaching English in another country, it's a good idea to find out what kind of visa and work permit requirements need to be met. Some countries require teachers to provide proof of specialization in the field they wish to teach. If you're traveling to a foreign country, it's always a good idea to make contact with the embassy to make sure you meet all the necessary requirements for employment. If you enjoy world travel and you like working with people, teaching English might just be the career choice for you. In most cases, you don't even have to speak a foreign language to qualify to teach English in another country. The pay range for TESOL positions varies depending on location. For example, teaching in the Middle East tends to provide higher salary rates than teaching English in other parts of the world. When considering where to teach it's important to consider quality of living, climate, attitude towards foreigners, pay rate, and accommodations. It's always a good idea to seek employment in a country that has always held a special interest to you, as it helps to keep you motivated and interested in your work. Joy of Teaching: "There\'s nothing like it"